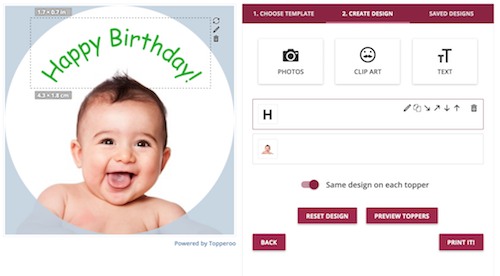 Once you are logged into your account, you will see the Topperoo designer with a range of templates. Select the relevant template, ensuring that it is the right size and configuration. If you don't see the template you need, have a chat with us at support@topperoo.com. If you are on the Topperoo Starter plan, all available templates will be displayed on-screen. 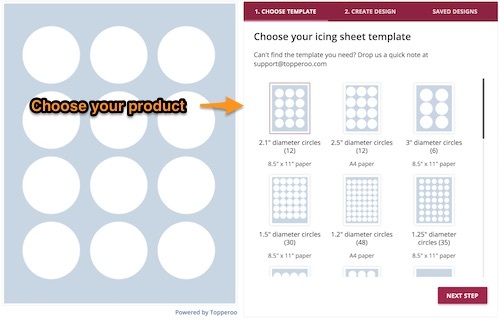 To load the right template, firstly determine your icing sheet size (US letter or A4), and then choose the relevant template under that category. Press NEXT STEP, and click PHOTOS, CLIPART or TEXT to start creating your design. You can choose from a growing range of clipart, and/or upload customer images from your desktop. For repeatable toppers, y ou can also create the same design across each cupcake topper by pressing the 'same design on each topper' toggle. You can also start your design journey by selecting from a range of pre-made designs, borders and patterns - just navigate back to the FIRST TAB to see all available designs in our template gallery. Press the "Preview Toppers" button to review the design, where you can copy the image link to share with your customers. Finally, once you are happy with the design, press the PRINT IT - where the design will be quickly converted into a print-ready pdf format for your printer.